OK – just so you know, I did not run as fast as a leopard. But, Day 2 did have some good running sections in it for me. Day 2 dawns much the same as Day 1. Although Stage 1 is done and dusted and competitors feel a little bit more relaxed, it is still only the beginning of the race and the first stage has shown everyone what the desert has in its armoury. The heat for some people is already proving taxing, the obvious trials of the sand, or for a lot the **** rocks and stones. And, as dawn broke and the bivouac gradually creaked into life, the adrenalin began to build again. Being an early bird (yes, I know my family will laugh at that!) 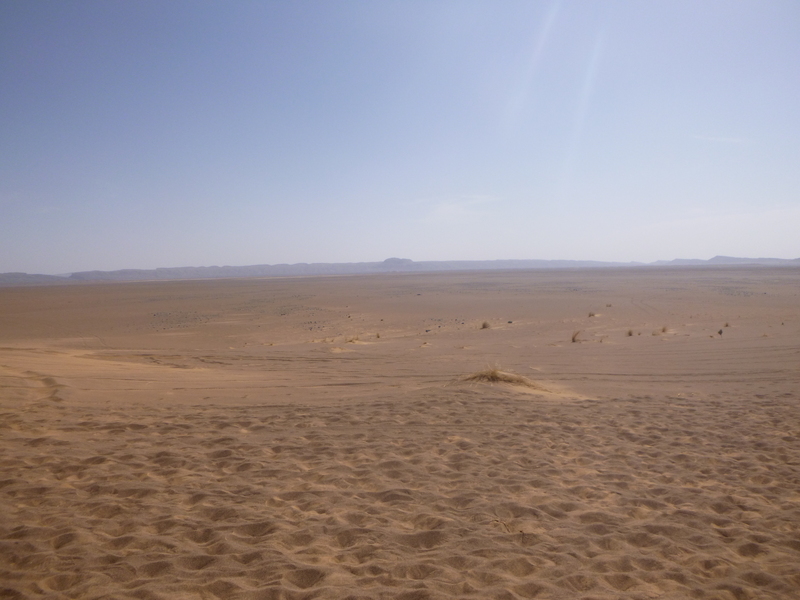 in the desert, I eased out of my sleeping bag after a warmer night – though no less noisy amidst the Snoring Choral Society of Tent 115, and headed off to complete my morning ablutions. I have to say that I was feeling remarkably confident as my legs felt good, as did my back, despite the hardness of the desert floor. As the sun began to rise and the morning temperature began to warm up and other runners appeared from tents brushing teeth, stretching, eating out of zip lock bags, the sense of ease, happiness and ongoing thrill at being in the desert grew. Back in Tent 115 the boys were also stirring. Our tent came down fairly soon this morning, and the daily ritual of repacking sleeping bags and kit into rucksacks ensued – as did my daily wonderment at the size of Mark’s breakfast! Aiden, Al & Mark – chillaxed faces on! The good thing about each stage after Stage 1 is that there is slightly less rush to the start line as we don’t have to get there early to do the 32 formation. So there is more relaxing and lounging about on the rug and posing without a worry in the world. No news, no social media, no emails, no nothing – just your pack, your food, your water, your companions and the prospect of heading out across the Sahara desert and wondering what magic lies in store for that day. Yep – in my head, we were on a Lord of the Rings style quest – The Fellowship of Tent 115 – but more of that later. Off to the start line for more of Patrick Bauer telling us how many had dropped out during and after Stage 1, (I don’t remember exactly how many) and what excitements lay in store for Stage 2. A blast of AC/DC’s Highway to Hell and we were off. 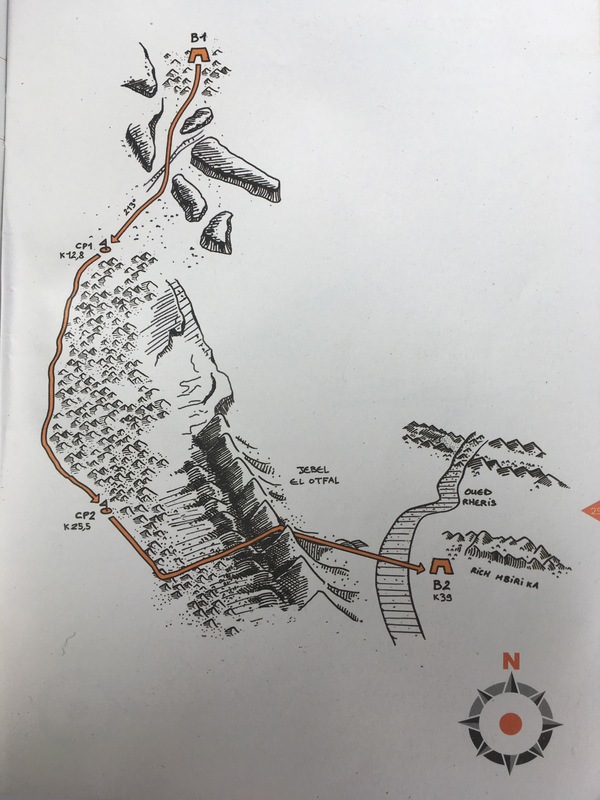 The word sandy cropped up a lot in the instructions for Stage 2 followed by climb/hill pass/hills/summit along with descriptions of dune fields, jebels, more dunes and towards the end, the El Otfal Jebel. I have climbed and descended in both directions the Jebel of El Otfal on more than one occasion. It is tall and steep on one side with a hot stony gorge, and tall and steep on the other side with an almost vertical dune. So steep that rope is generously provided to assist the climb on one side. 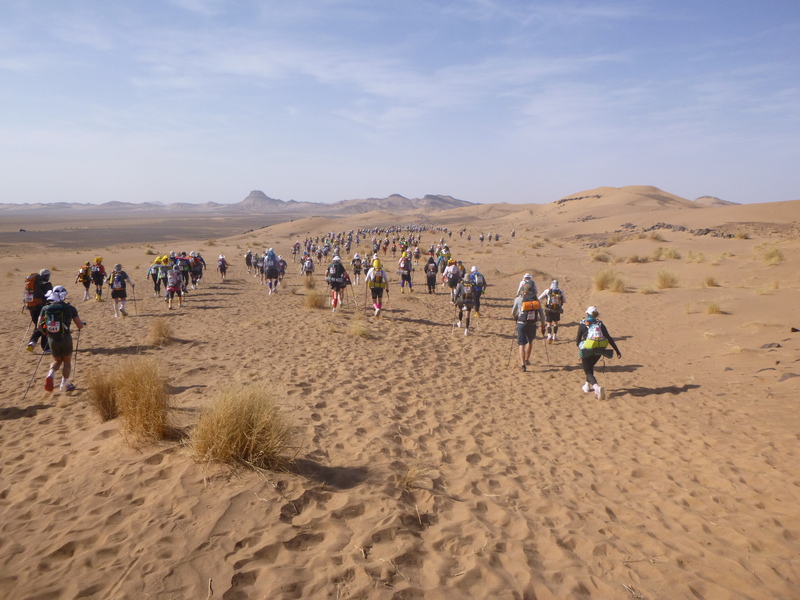 However, the jebel didn’t appear until towards CP3 – there was a whole host of adventure lying in wait before then. I set off and fell into step with a fine young man called Benjamin from Greenwich. 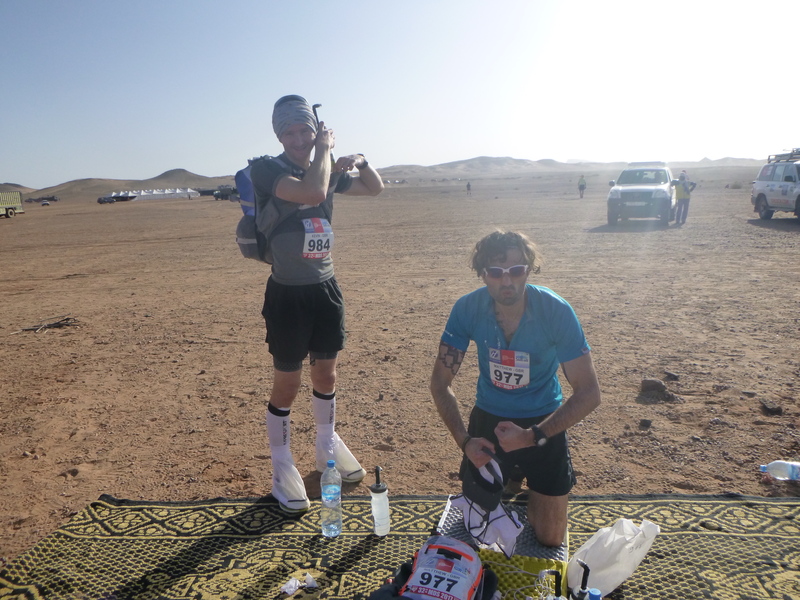 We talked the usual chatter, where we were from, why we were running the MDS, and keeping a good pace. Before too long and before the heat really started building we stumbled into CP1 where we parted company. I stick to a fairly similar ritual at each check point unless there is a need for medical aid. I get my bottle(s) of water, refresh my drinks, eat a snack, and then push on. Which generally takes about 10-15 mins. 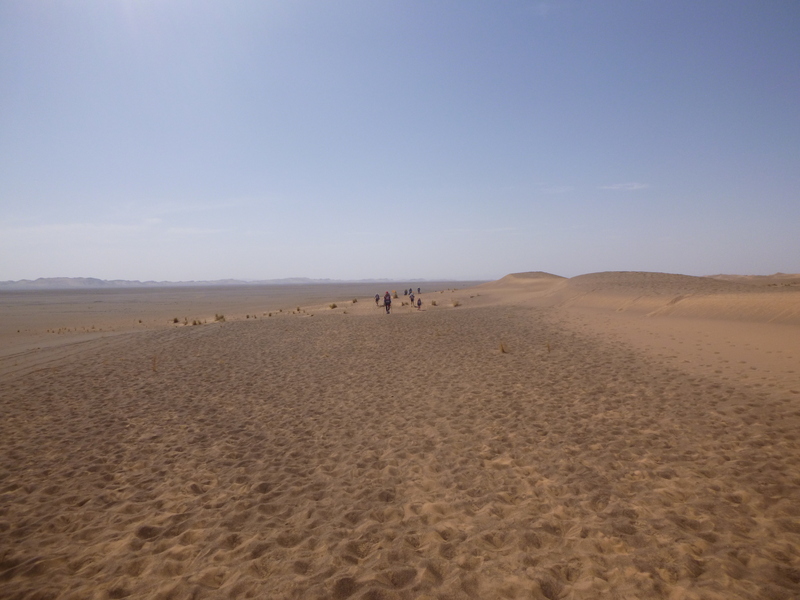 Leaving CP 1, I headed out across a small dune field scattered with desert vegetation here and there (spiky grasses and thorny bushed) and then headed out across some small dunes and sandy mounds! 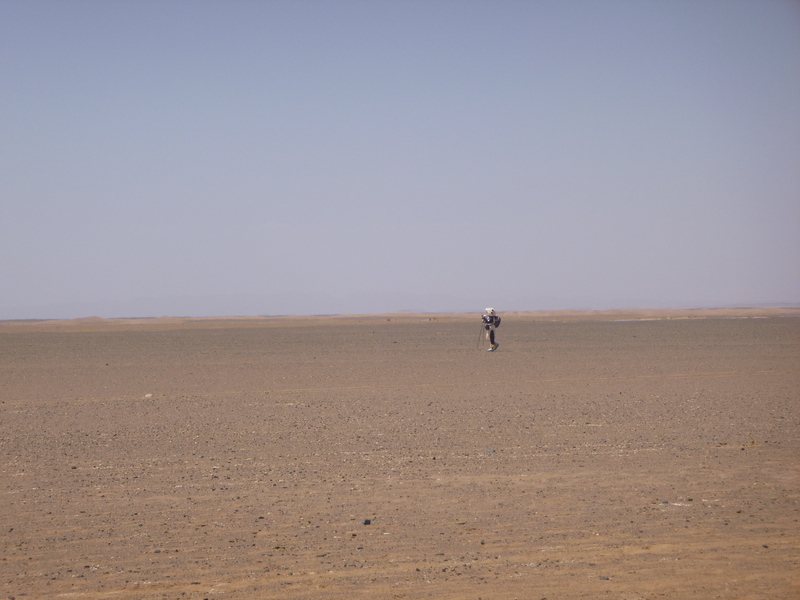 whom I yo-yo’d a few times over the course of the week and the set off alone across a long desert plain with the dune field to the left. The terrain was actually quite pleasant and flattish… But, vast with runners disappearing ahead of me like a line of ants. The heat was building and threatening to become unforgiving. There was nothing for it but to gain some momentum or fall into a desert like stupor in the heat. So I began to run and stuck to a rhythm of running for two markers, then walking for one, and then running for 2 and so on. And I did this literally following the markers rather than the runners. Runners in races like this are like sheep and follow the leader. But, not necessarily the straightest route! I followed the markers and a sparse number of runners with the main pack of “ants” to my right. This was probably a good thing for my fellow runners though, as to entertain myself I decided to sing. I have always sung in the desert – it is a strange and wonderful thing, especially as the lyrics to songs I wouldn’t normally sing come back to me. Not only do I sing the full version of Les Miserables, I also rehash many of the songs from my drama school days – which amazes me that I even remember them. But with the sand, the vast blue sky as my audience I was able to really belt out some good old musical numbers only vaguely aware of perhaps the odd look from another runner! It felt amazing and although I was probably only really shuffling along, I felt like I was flying. It was hot though and it has to be said that although electrolyte drinks do not improve with the heat, they still go down quite well and the distance from CP 1 to CP2 was a good 12-13km. So, getting the hydration right was definitely key as the heat kept rising with very little breeze. Distraction from the heat came in quite an unexpected manner. 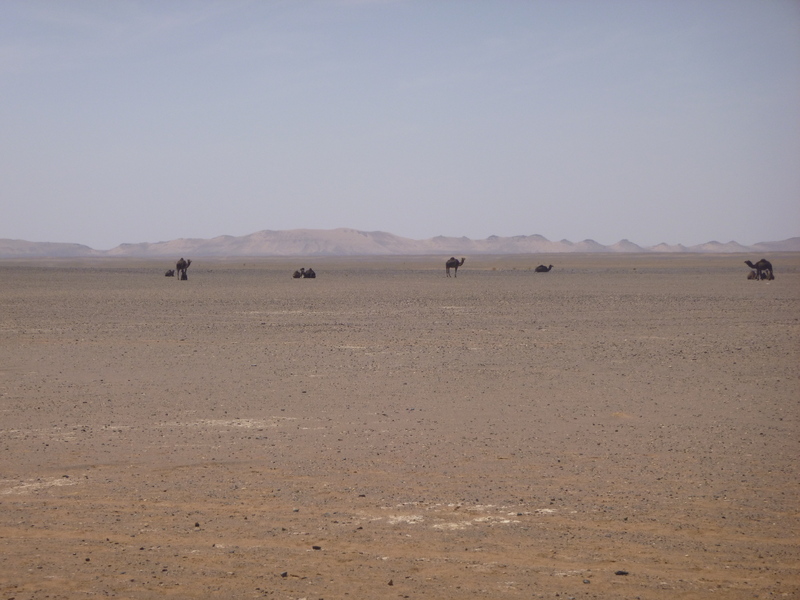 In the distance across the plain to the right where the desert seemed to just disappear in an endless heat haze, I glimpsed some wild camels. They were quite beautiful as they appeared on the horizon. Creatures of wonder in this dry, hot, unforgiving environment. They, however, were not the distraction. They were quite far off the trail and to go up close to them would have taken me a good few hundred meters out of the way. Of all the runners striding off to have an up close wild camel experience was a seriously crazy Japanese runner called Yoshizo. 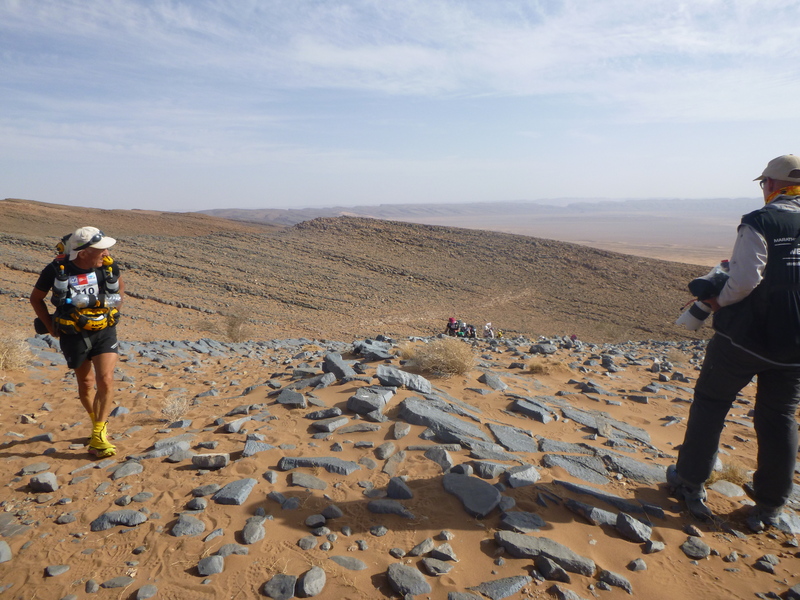 Yoshizo is quite crazy – he has attempted the MDS on more than one occasion, but, not previously completed it. This is not what makes him crazy. What makes him crazy is that he does it dressed in a full cow costume – and not a light weight one at that! So, there he was marching out to the camels adding at least an extra 300/400 meters to his race in the heat of the day. You might not think that is far in general terms, just to see some camels. 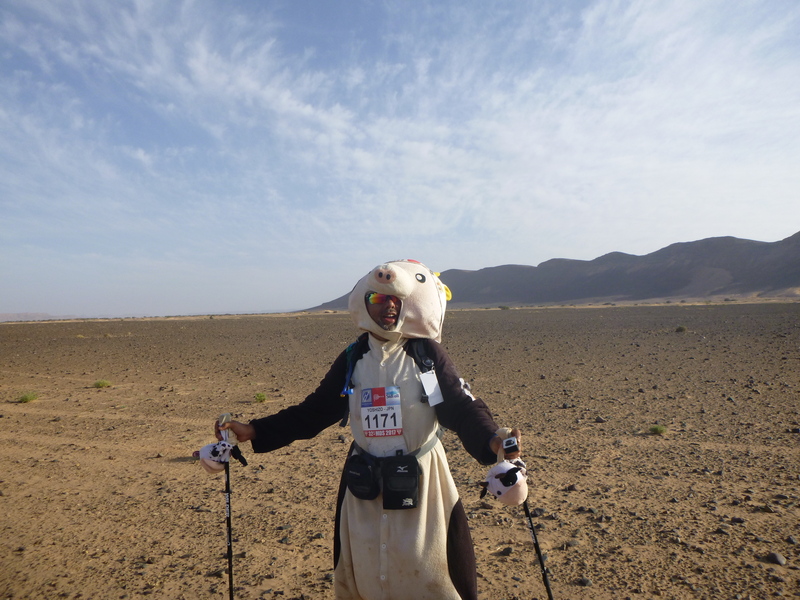 But, in the heat of the day, with a pack, diminishing drink (as we were nearing the end of the stretch to CP2) and wearing a heavy warm looking cow costume complete with oversized head? Complete madness! Hey ho – just glad it wasn’t me as I passed a house on the right (literally in the middle of nowhere) and jogged into CP2 with a big smile to the CP checkers and medics, and gratefully received my water ration. 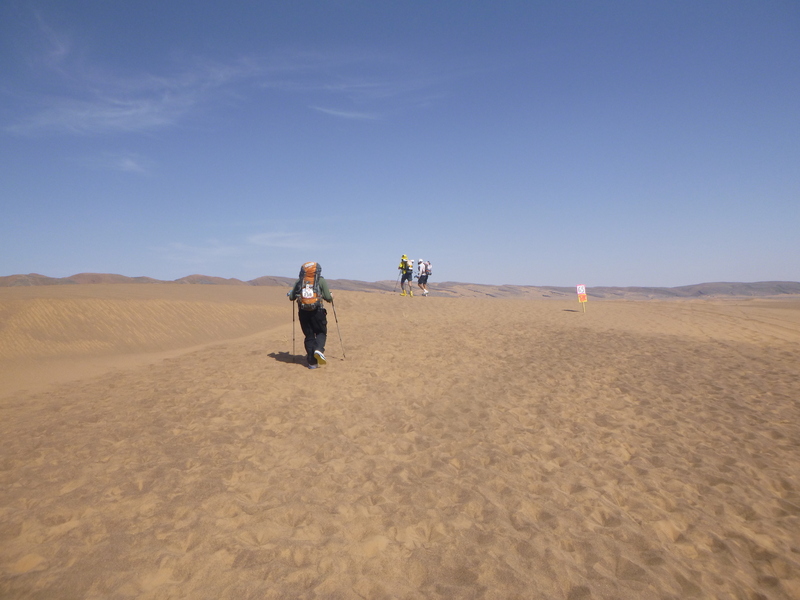 Heading out of CP2 we entered a slightly bigger dune field of golden sand, which started out with gentle undulating dunes that became steeper and steeper. I joined a runner called Mark who made me feel hot just running alongside him as he was going for full sun protection kit wearing full length loose trousers and full sleeved top, with his head completely covered. If I did meet him later on after the race had finished him I would not have been able to pick him out in a line-up, as I had no idea what he looked like! However, he was a fascinating man with many traveller’s tales and it was very enjoyable yomping alongside him, exchanging tales. 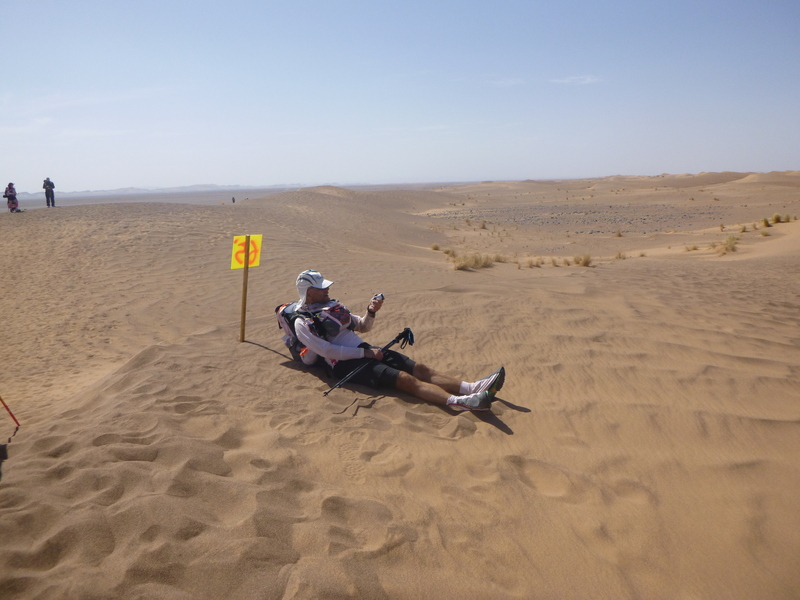 The dune fields are interesting sections of the course – some people love them, some people hate them. I fall into the love them group. There are no stones and the going is soft underfoot. I have always found it surprisingly easy once you get into the rhythm of the dunes to get a good pace up. Some people however, take it easy and go slow through them or even pause to catch their breath or just take in the beauty of them. 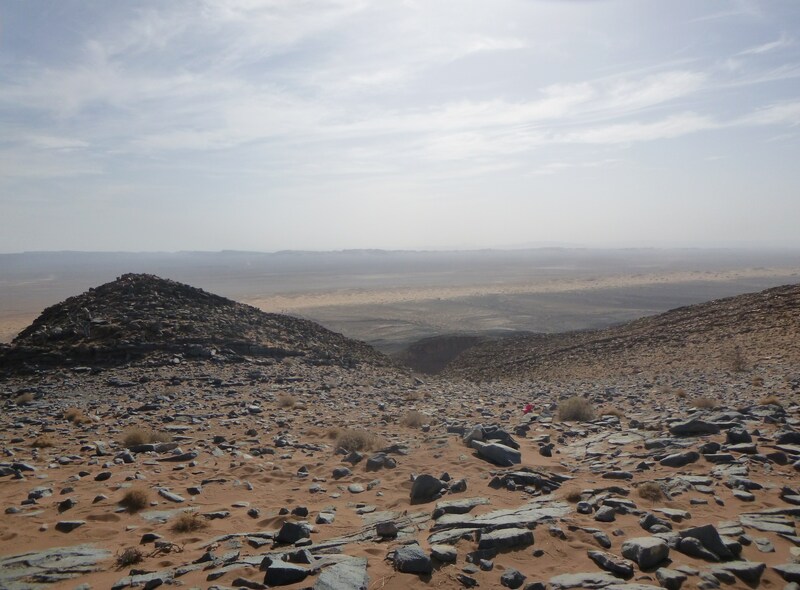 Once out of the dune field though, all thoughts of enjoying the beauty of the desert rapidly vanished against the onset of the increasing rocks as we entered new terrain along an oued bed leading to the gorge to take us up to the summit of El Oftal jebel. Rocky stony terrain doesn’t quite do the terrain justice, or the complete lack of wind up the ascent of the gorge. The lack of chatter amongst fellow competitors as we climbed and occasionally passed someone semi-collapsed at the side. I passed three runners going up who looked rather beaten by the heat. I gave one, a Frenchman, some of my salt tablets as he had dropped all his in the dunes somewhere! You always ask a runner who looks in trouble if they need help, but climbing the gorge you also want to just keep going, concentrating on putting one foot in front of another, sipping water or energy drink every few steps, not looking up to see how far you have to go. I was humbled at one point as I went past a Mexican runner who is blind, being led by his guide who was describing each and every step. I greeted them and muttered an encouraging something or other and pressed on. Other runners never cease to amaze me or humble me. Coming out of the gorge section you would think there would be some relief… But, it is not the top, not by a long shot. There is still a good scramble amongst big stones that slip occasionally in the sand under foot. At at this point, you are able to look back and down and take in the incredibly breathtaking expansive view of where we have just ascended. Still, onwards and upwards. Reaching the summit of the jebel is an extraordinary feeling. You feel a bit like you should have crossed the finish line. But, there is still a checkpoint to come. You are ridiculously hot. Despite some relief from a summit breeze, your legs feel tired from the climb and thoughts of a cool drink certainly plagued my mind – and having to make do with a slug of drink from a warm bottle of electrolytes has to suffice. A smile for the photographer is not the easiest thing to produce at this stage. Feet feel hot in your trainers. We headed along the ridge to the dip in the view where the way down reveals itself. A steep sandy dune initially assisted by a rope and then one just yomps down the dune. It sounds easy. But, with a good number of runners having already yomped down throughout the day, a lot of rocks had become loose and being careful with ones footing was quite important. A water bottle tumbled past me as I set off into my yomp, followed by a shriek from it’s owner, Vivienne from the USA. It was saved and restored to her at the bottom! 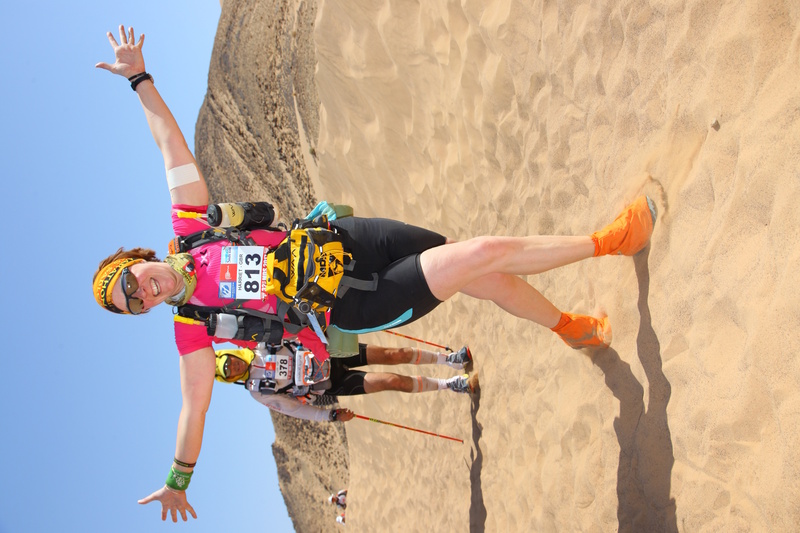 As I reached the bottom of the jebel dune descent, I had to acknowledge to myself that thinking I was saving money by using my gaiters from MDS 2012 had been a stupid idea. Whilst they might have looked in OK condition when I dug them out of my drawer, their ability to stick to my shoes over the toes was a different matter. It felt like I had quite a lot of the sand from the dune in my shoes. 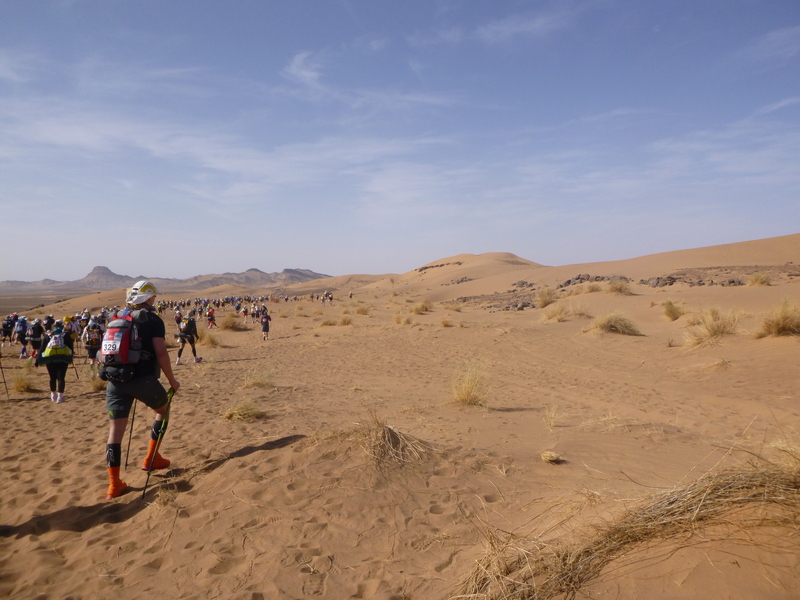 But, with just under a kilometre to the CP3, I kept going – heading into what has to be the worst section of terrain in the whole of the desert. The “stony” terrain is just that. Sharp stones for almost a kilometre. 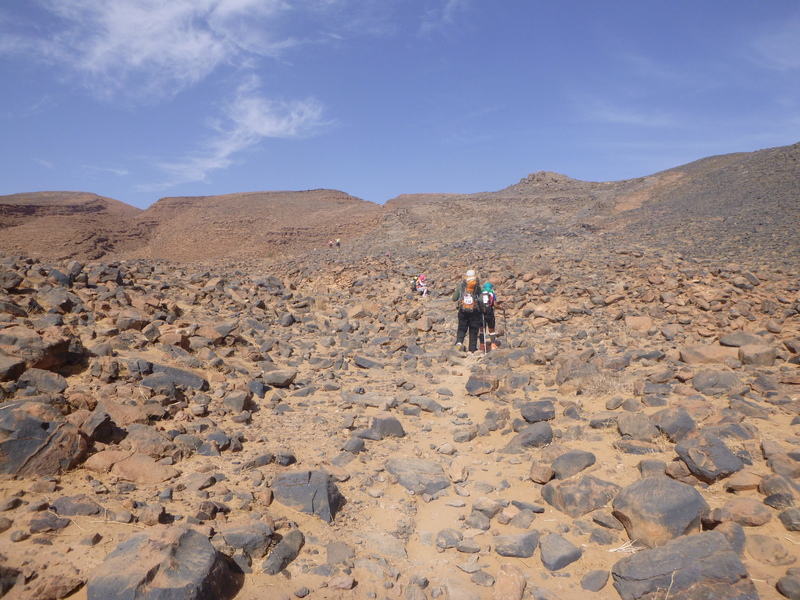 But, sharp hard stones that feel like they dig into your shoes with every step – and it looks like you are running on planet Mars – although I must confess, I wasn’t running this section. My feet were hot, my big toes were hurting as I unavoidably hit more stones. As I neared CP3 with great relief, I was almost completely alone except for one runner about 50 metres in front of me. As he crossed the line into the CP he was greeted loudly by all the checkpoint marshals. He was none other than Yoshizo, the crazy cow dressed Japanese runner. All the race marshals were comically mooing at him and cheering him loudly. As I approached the checkpoint, I felt decidedly annoyed as all I could hear was “Aller Yoshizo, moo moo moo moo”. I thought to myself, this is not good enough. I want someone to cheer for me! So, raising my arms aloft, I shut out the increasing pain in my feet and ran as fast as I could across the timer mat into my number channel whooping and dancing as I could. Whose arms should I run into…? Those of Patrick Bauer!!! He greeted me with an enormous embrace and kissed me on both cheeks, cheering: “Aller Harriet! Quel sourire merveilleux. Vous êtes fantastique. Aller, aller!” That embrace made the pain in my feet disappear and I felt as if I was running on air. It literally made my day, if not the whole week there and then! Buoyed up and feeling on top of the world, I quickly replenished my drink. 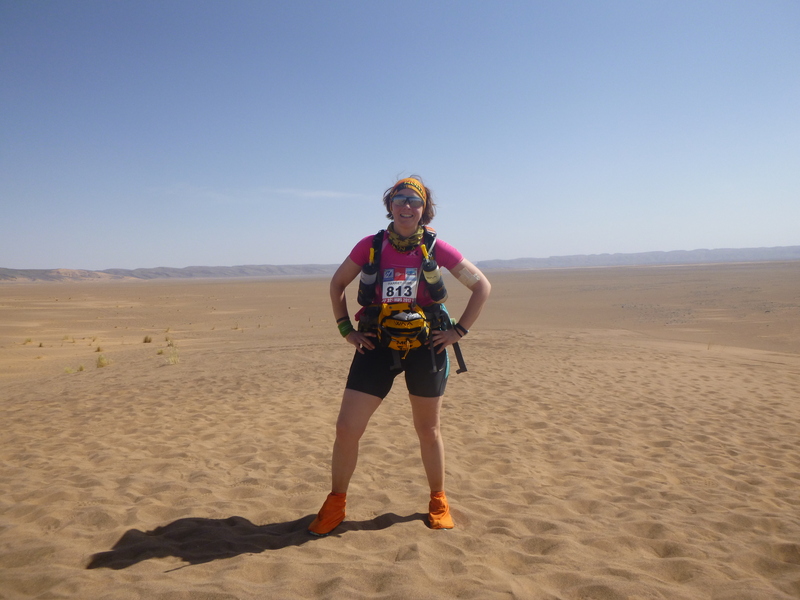 I decided that my feet didn’t really hurt and I would push on for the four kilometres to the finish line without emptying my shoes of sand. They would be just fine. I was determined not to waste time as there was no way on earth that I was going to let a Japanese man in a cow costume beat me that day! So, I set off at a storming fast pace. Euphoria doesn’t last long in the desert. In fact my speed dwindled distressingly quickly as the throbbing pain in my feet distressingly returned at a rapid pace! 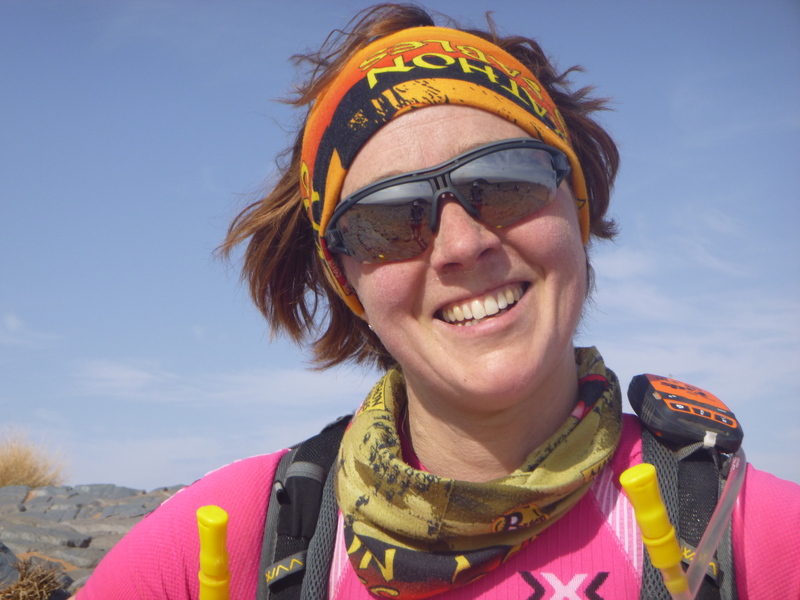 I was joined by Vivienne, the American who’s water bottle had raced us down the dune, and another US runner called Joanna. And, also by none other than Yoshizo the Cow! We made an interesting bunch. Joanna was a chatterbox and at this point of the day I had run out of tolerance for overenthusiastic American cheerfulness and chatter. I stuck with her for about two kilometres. I was going through scenarios in my head of how to stop her talking without being rude when we came across a beautiful river bed that had some water in it. It was way off to the left, off the route and I decided to join Yoshizo on his clear intent not to miss anything of any wonder in the desert and go check it out, joined by Vivenne. Joanna thankfully pushed on for the finish line. Vivienne, Yoshizo and I returned to the correct trail after our little detour. We poured some water over a grateful Yoshizo who was sweating profusely in his cow head! Along the course of the oued/river bed was quite a bit of vegetation. Hiding behind a bush just over a sandy mound was Steve (the UK rep – he looks after us all magnificently and always greets us with a hearty fist pump), along with his fancy camera. I hailed him loudly as he snapped away with his camera and paused briefly to chat. 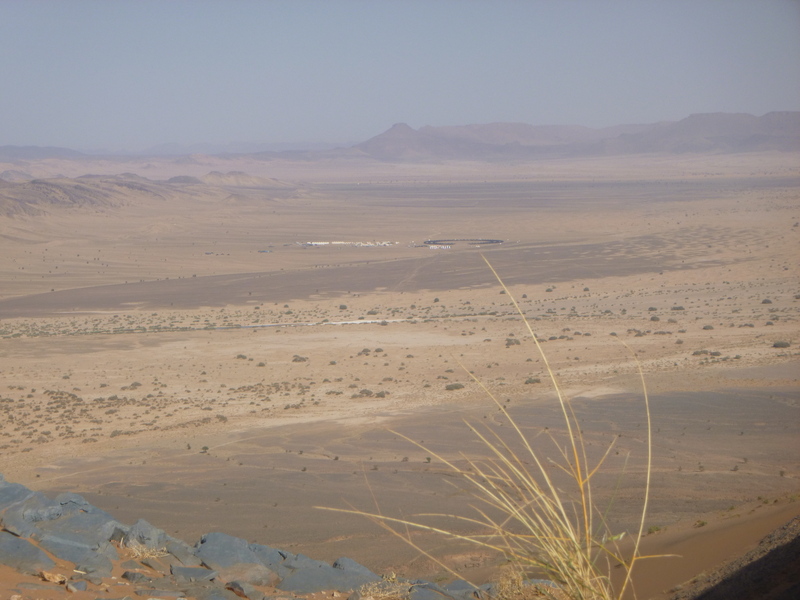 In the distance the tents of the bivouac were becoming closer and closer. We pressed on, pausing by one of the last course markers to take some photos with Yoshizo in his cow costume. As we did this, who should catch us up? None other than Al and Mark, striding along. I was amazed as I thought they had long overtaken me. So, I must confess to being pleased that I wasn’t going to be last into the tent. But, jointly last with them. 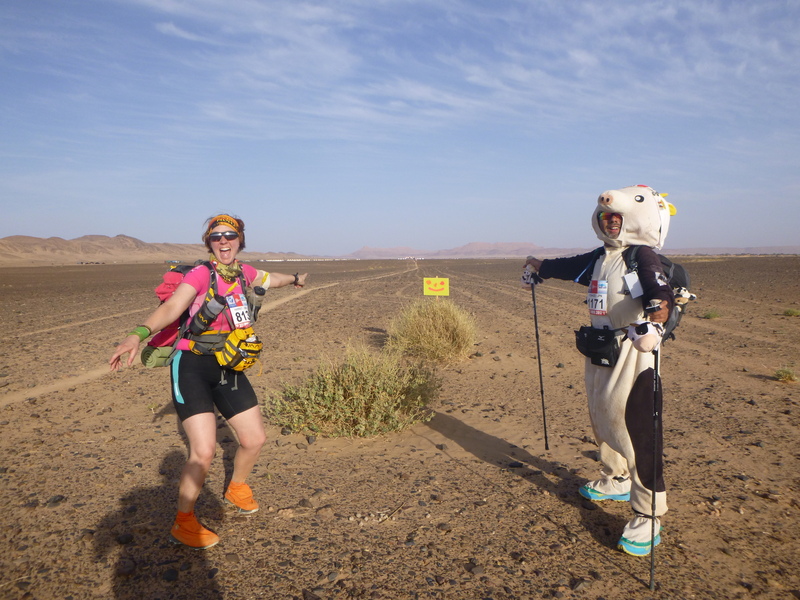 We caught up – they were amongst the crazy runners who took a detour to check out the wild camels! Crazy boys! Then the five of us pressed on to the finish line and in the true nature of the MDS we all joined hands as we crossed the finish line. Hopefully, with the cow in our midst, a good photo opportunity for the MDS website publicity! Over the line, a wave and a blown kiss to the webcam, we were there – drinking our gratefully received, but still very small cup of Sultan Moroccan tea. We passed through the water collection point and felt the relief of making it through Stage 2. I have to say – it was awesome to finish the stage with Al and Mark again, and to head back to the tent with them. The people you share your tent with become crucial to the feeling of solidarity and I was rapidly beginning to realise what an awesome bunch of guys I was sharing a tent with. We stumbled back to Tent 115 where Kevin, Matt and Aiden were kicking back in the afternoon hazy sunshine, and they greeted us with hearty hails. Kevin helped me (not for the last time) to remove my somewhat useless sandgaiters. Not only were they useless at keeping the sand out of my shoes, but the zip to get them off my feet on both had now become well and truly stuck. I tipped rather alot of sand out of my shoes. I decided then not to take my socks off but to head straight to Doc Trotters, accompanied by Al. Al had a blister on one of his toes. We stumbled off to Doc Trotters’ tent. The queue was a little longer than the previous night and was still being marshalled by the quite scary French triage nurse/Dr. We sat down on the stools outside the tent and proceeded to wash our feet in the supplied antibacterial wash provided at the medical tent. I was just taking off the tape from my feet when I was accosted by the scary triage Dr. She was really quite frightening and bellowed at me as to why I was taking the bandages off my feet again. She said I shouldn’t, but leave them on. Then I wouldn’t need to see the doctors. I looked at her amazed… and said pointedly, that my feet needed redressing as they had got worse. Al was also accosted by her. But, his blister was clearly visible as it wasn’t already covered by tape. I took the tape off my toes and that shut her up! My two big toes looked really quite impressive – from a medical point of view. The triage Dr conceded in her strong French accent, “OK, yes, you need to see the doctor. Wash your feet and wait.” I smiled at her, slightly triumphantly. The toenails on my two big toes had somehow been lifted away from the nail bed and underneath both of them at the back of the nail, by the cuticle, were large (and I mean large) blisters, rose coloured. Al looked at me – and we both just laughed. I didn’t have to wait too long until my ticket number was called. It feels like you’ve won the lottery when your number is called. You watch with envy whenever someone else’s number is called and they limp/hobble into the tent. My mission is to always try and walk normally and not hobble, which is quite difficult. I eventually hobbled through into the tent and to my delight I had Yo, the same A&E doctor from Paris. Someone had written on his name badge, so that it read “I love You”. After the next hour and a half, during which it took to sort my feet out, I also loved Yo and told him so! He sliced into each blister and drained it and somehow pushed my toenails back into place. One of them did hurt quite a bit and I did bite down quite hard on my knuckle whilst he grinned at me and laughed. But that is it – you have to laugh and so chatting with Yo and the medic attending to my neighbour we laughed at everything and nothing – mainly at the state of my feet more than anything. I eventually left the tent with strict instructions to stop kicking stones!!! I made my way back to the tent. The email tent had closed, so I was unable to send a message home. Hopefully, everyone following the race will have seen that I completed the stage and not worry. Back at Tent 115, food was of the most imminent importance and swiftly consumed. The postman had been by the time I had got back to the tent and comedy ensued thanks to my brother James! It is common knowledge in my family that the one sport I find duller than ditch-water is golf. But the rest of my family seem to absolutely love it. Yesterday had been the final day of the US Masters at Augusta. Did I care? Not in the slightest. In fact each member of my family clearly thought it amusing and necessary to email and tell me how exciting the final day’s golf had been and who had won, as if I cared! But, James had decided that as I was in a tent of boys, they probably did like it. So, he sent me a blow by blow account of the last day which I had to read out loud to Tent 115. I ended up having to read it out loud about five times, with the boys listening as if it was an episode of Jackanory at bedtime! It was full of phrases like ” a lyle putt down hole”, “bogey at 18, play off, birdie” , blah blah blah. James will be pleased to know that he rapidly became king of emails to the tent. Although this was also aided by another email he sent ribbing Kevin for his feeble attempt at a “Dab” as he crossed today’s finish line in front of the webcam! Smashing to read your adventures. I just wish you could look more grumpy and miserable, but that doesn’t seem to happen. Well done – joy is one of the hardest and highest achievements. Toenail part: SHUDDER. You lunatic. The rest of it – you rock girl. Love that huge smile, even when you’re knackered. Don’t know how you do it! Good grief woman! How do manage to still look so bloody gorgeous after ascending that huge dune! ?